A few weeks ago, I was contacted by the nice folks at Two Horse Tack asking if I would like to review their beta biothane tack on my blog. I agreed, chose a grooming halter to review, and then a bunch of nor'easters and other horrible weather happened. But it's (slightly) improved out there now, and I have a review here for y'all! My experience with synthetic bridlework has been limited at best. The barn where I taught lessons when the Wintec brand was starting to become popular with recreational riders used synthetic tack for the lesson horses, and it always left me unimpressed. It was stiff in cold weather (actually, it was stiff all the time), cracked easily, was slippery, the cheaper stuff wore terribly, and it all felt like plastic. It pretty much turned me off synthetic tack for life. Aside from purchasing a set of Tekna open-front boots years ago that I was quite happy with, I have not used synthetic tack since the days of Wintec saddles and no-name synthetic bridles on lesson horses many moons ago. Needless to say, I initially did not have terribly high hopes for Two Horse Tack, but when I took the halter out of the box I was pleasantly surprised. My first impressions were, "Wow it's BRIGHT" and "It's so soft!" If you like color, this tack is for you. The "dark blue" I'd requested is more of a SUPER BRIGHT royal shade, and it's awesome. Unlike colored nylon halters, it also won't fade, which is a bonus! The beta biothane is also incredibly soft and flexible, light years away from my memories of the original Wintec tack of my youth. Even in the cold of this never-ending Pennsylvania winter, it doesn't lose any of its pliability. The stitching on the halter is tight and even, and while my personal preference would be for it to be color-matched to the biothane (the only color options for stitching are black and white), it's nicely done and not terribly distracting. The hardware is bright, heavy, and high quality, and the design allows for adjustment at both the crown and the noseband, which as the owner of an under-sized equine I always appreciate! I ordered a cob size, as Dino is a very very consistent cob in all things, but found the grooming halter to be sized a bit small. I had to let out the noseband all the way to the last hole, but it fits him well on that setting, and perhaps it will fit him even better when he sheds out all of his abundant face hair. The grooming halter, functionally, is great. It makes it so much easier to groom Dino's face, and clipping his goat beard was a breeze without having to un-buckle and re-buckle a traditional halter throatlatch. The Two Horse Tack grooming halter proved to be a sturdily-made, useful, fun-colored piece of tack that I give two thumbs up! 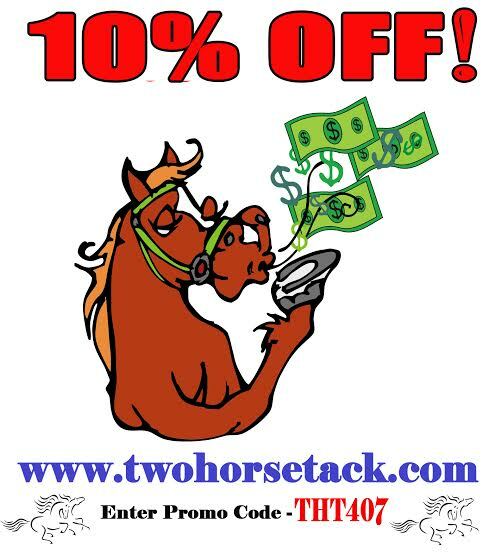 If you want your own super-soft, bright synthetic tack, hop on over to Two Horse Tack and take advantage of the 10% off discount code at the bottom of the page, or sign up for their newsletter! I was pleasantly surprised by this material as well. I have the side pull bridle for my old man, and it's very nice to use. Hi! I've been eyeing their side pull for a while and am kind of afraid of not being satisfied if I buy it, seeing as there are so few returns about it, and two horse tack seems to have a bad reputation with costumer service :/ so I just wanted to ask you if you were still satisfied and would recommend it? Oh I have one of their halters! I like the halter for sure. Wouldn't get a bridle, but I like the halter!